Your friendly guide Peter & his wife! Why Wienguide private tours Vienna? Licensed, Enthusiastic, Fun, a lot of information & TOPRATED on Tripadvisor!!!!!!! Born in Burgenland, I spent my childhood there, and at the age of 18 moved to Vienna. The city amazed me right from the beginning – and continues to do so today. After a couple of years of guiding and enjoying Costar Rica I returned to Austria. Once back in Austria, “IT” happened. “IT” being my son Maxi, who is now almost 21 years old. As a serious father I naturally needed an occupation that corresponded. Good advice was expensive. On the one hand I spent my winter as a tour guide in Costa Rica, which I didn’t want to stop, and on the other I also wanted to work with people in Vienna and use my knowledge of history and languages. Had the job of private tour guide Vienna not existed, one could have created it for me. The job was perfect – and today, after more than 20 years it still brings me as much joy as it did in the beginning. What else has taken place? Actually, not much. 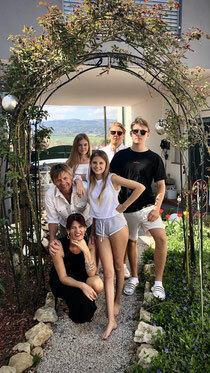 Oh yes, there was the birth of my son Leon, almost 18 years old now and then my daughter Alina (15) and now number 4 is already born and meanwhile she is already 11 years old. Her name is Valentina. She is now the "highlight" in our big family! So there is a lot to do and I am very much looking forward to the next couple of years. My son Max is joining his daddy already as a driver & guide during most of the tours! Lets see if my daughter Alina takes over the accountancy and booking and....Family business! Meanwhile I do have a couple of excellent handpicked tourguide on my side! All of them just wonderful, experienced and very charming! You are warmly invited to join our private city tours in Vienna!